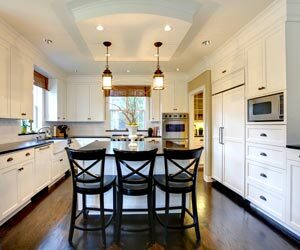 Nothing adds value to your Grand Rapids home more quickly than updating or remodeling your kitchen or bathroom. These two rooms in your home receive daily use and usually suffer wear and tear sooner than any other room in your home, thus make sense to be the first choice in a home remodeling project. An update of fixtures, appliances, and accessories can make an immediate and dramatic difference in any room in your home. Our Grand Rapids remodeling company can assist you when making these decisions. Whatever suits your taste and sense of fashion, you can begin by choosing beautiful new kitchen cabinets; then add eye-catching fixtures, appliances and other accessories that will complement and accentuate your new kitchen design. After kitchen cabinets, other great ways to make a big impact on the total kitchen design are to consider adding hardwood floors, ceramic tile, stainless steel sinks, new wall colors, new granite countertops, backsplashes, creative lighting fixtures and much more! An island addition is also something that will "set off" your new kitchen. To complete your kitchen remodeling project in style, you can add new furniture such as breakfast nook tables and chairs, paint or barstools. Our Grand Rapids Kitchen Remodeling Contractors at Grand Rapids Remodeling can help you make this kitchen transformation a reality! Bathroom remodeling is another great way to update your Grand Rapids home, which also increases the value of your home tremendously. Don’t minimize the importance of this room in your home and in your life. Important time is spent here as your days begin and end, and making this room a relaxing, enjoyable experience is well worth the time and money. Remodeling your bathroom will certainly bring pleasure not only to you and your family, but also to your guests. Principal considerations to make your bathroom more efficient and more beautiful include; Cabinets, ceramic tile, counter tops, vanities, sinks, flooring, bathtubs, Jacuzzi tubs and showers. Tile work in a bathroom can really enhance the room and bathing area. Why not install a small flat screen TV to help relax while in the tub or to watch the news while preparing for your day? Our Grand Rapids Bathroom Remodeling Contractors at Grand Rapids Remodeling can handle all of this for you. Our Grand Rapids remodeling team is innovative, creative and professional and will treat your Grand Rapids Kitchen remodeling project with care and insight from start to finish! To request a free in-home remodeling consultation and estimate, CLICK HERE. For general questions contact us here or call (616) 512-5478 .